Red Worms are the number one compost worms world wide. Millions of tons of waste are composted yearly through redworm composting around the world. Start your own worm bin, worm bed or composters today. 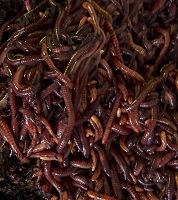 We carry red worms, composting bins beds, pH meters, bedding and much more. We are a one stop source for information, redworms and supplies. Check out our articles, products and forum. Please also subscribe to our composting newsletter which is a monthly publication delivering you the latest in worm care and specials. Join the millions of people who are red worm composting and using the by-product of red worm composting to create organic worm castings instead of chemical fertilizers. Redworms eat our garbage and turn that compost into gold. You can't buy a better fertilizer. Your garden and your family will be healthier when you garden with red worms. For More information you may want to check out Raising Earthworms for Profit or subscribe to our newsletter which will also show you how to raise earthworms for your bait, composting or profit. Join our forum for more information about growing red worms for composting, profit or just to talk to others.